The Lab is committed to high product quality. Unfortunately, however, it can occasionally happen that individual products do not meet our high standards. Should this be the case for any of your articles, then we want to apologise for the inconvenience in advance. Knit and weave faults / flaws - Seam errors - holes and seams that have opened within one month from date of purchase. Shrunken goods - Discoloured goods from not respecting the washing instructions - Stains - Damage from not respecting ironing instructions etc. 1.1 What is a Displate? 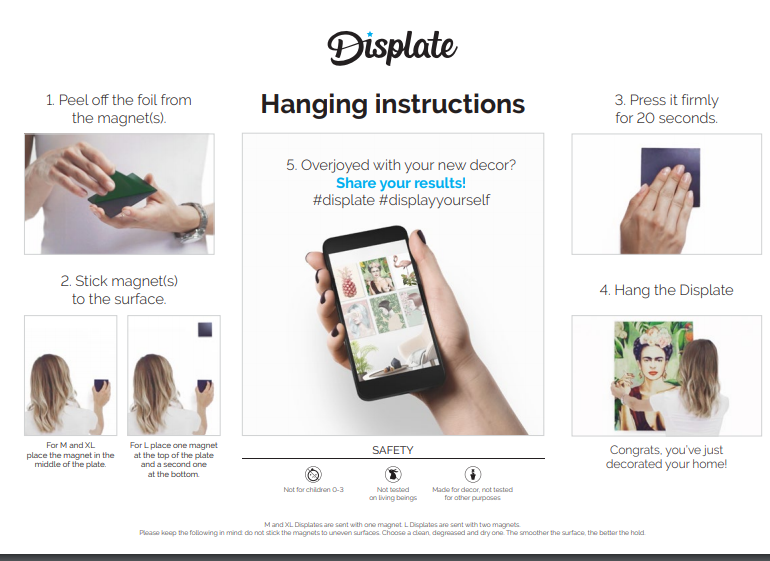 Displate is a magnet-mounted metal print. It’s durable, it’s steel. And you don’t need any power tools to hang it. 1.2 How to mount your displates properly? 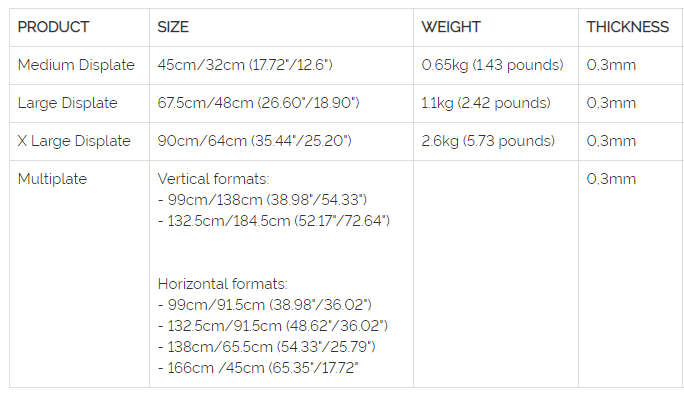 1.3 What are the sizes, weights and thickness of Displate products? 1.4 Is the mounting system included in the price? 1.5 Is it possible to stick a Displate on a wallpaper? We generally recommend to mount a Displate on a flat, untextured surface. A lot of our customers stick it to their wallpapers, however we are unable to assess whether it will hold on your particular wallpaper. 1.6 Can I mount my Displate on the brick surface? In general, we don’t recommend to mount a Displate on a textured wall. In this situation, we can suggest using a few pieces of adhesive gum to stick the Displate to the wall. Alternatively, you can make a hole in the magnet and mount it to the wall by using a nail. 1.7 Can you recommend a different method of mounting? In general, we do not recommend any other methods of mounting a Displate on the wall than using a magnet. However, we can suggest making a hole in the magnet and mounting it to the wall by using a nail. 1.8 Can I remove a magnet from the wall? You can try to remove a magnet from the wall by using, for example, a hair dryer. The glue will warm up and get away from the surface easier. It is worth recommending that once a magnet is removed from the wall, it cannot be used again. 2.1 Are all sizes the same? Sizes may vary because we work with multiple suppliers. 3.1 How can I make an account? You can register an account by linking to Facebook or by filling out our form via this link. By creating an account with our store, you can move through the checkout process faster, store multiple addresses, view and track your orders and more. 4.1 Will I receive a confirmation email for my order? Yes, you will receive an automatic confirmation. If any problems occur, you will be contacted by our team. 4.2 Can I change or add another item to my order? Send us an email at info@thelab.be, depending on the situation, this may or may not be possible. 4.3 How can I change my shipping address? 4.4 Can I cancel my order? How much time do I have for this? 4.5 I have cancelled my order. When will I receive a refund? 5.1 What countries do you ship to? We ship worldwide, with a few exceptions. Not shipping to your country? Send us an email at info@thelab.be for more information. 5.2 What are the shipping costs? Shipping cost vary, depending on country. 5.3 What is the estimated time of delivery? Usually, items are shipped the next day. Shipping times may vary depending on stock, holidays or irregularities. 5.4 What is the estimated time of delivery when a product is not in stock? When ordering an item that is out of stock, you will be contacted by our team. They will keep you informed on the delivery timeframe. 5.5 How can I check the status of my order? You will receive updates through the email address you have given us. 5.6 What can I do if my parcel lacks its content, the received product has some defects or is damaged? If this has happened, we are terribly sorry. Please contact us at; info@thelab.be. 6.1 What is your return policy? All items can be returned if unworn and in original condition with tags. You have 14 days from the day of receiving your package to return the items. A return will only be accepted if the article in its original state is sent back in the original packaging. 6.2 What is the address for return? 6.3 Will any extra fees be charged for returning products? 6.4 I have returned my order. When will I receive a refund? Once the return is approved, the amount paid is refunded immediately. 6.5 Can I exchange any of your products? Exchanges are only allowed if the product is in unworn, in original condition & hasn’t been opened. You can pay with PayPal, Visa, MasterCard, Bancontact/Mister Cash, iDeal, Sofort Banking, Belfius, Direct Net, via bank transfer and Bitcoin. 8.1 Do you offer gift vouchers? 8.2 Where can I get a gift voucher? 8.3 How long is it valid? 8.4 Can I check how much credit is still on my voucher?